Through a joint venture founded in 1998 with Convault of Denair, California, we now provide a range of Convault above ground storage tanks. 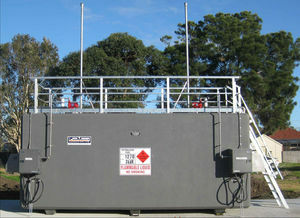 Convault tanks are designed to overcome the environmental problems associated with underground fuel storage tanks and unprotected above ground storage tanks. The tanks are protected from impact from vehicles and have a two to four hour fire rating as a result of the 150mm thick concrete exterior on all sides, top and bottom.